This comprehensive reference by a Microsoft expert covers allaspects of the new Windows release The much-anticipated release of Windows 7 will have numerouschanges, and you'll need a complete guide to take full advantage ofall it has to offer. 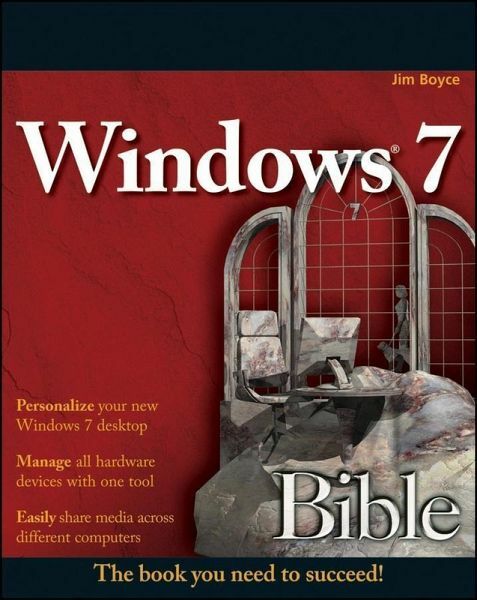 Windows 7 Bible covers navigationchanges such as pinning to the task bar, full screen preview withinvisible windows, Jump Lists, Home Group, Sticky Notes, and manyothers. It shows you how to use Internet Explorer 8, includingfeatures like Web Slices and Network view changes, and guides youthrough all the new desktop features. This reference thoroughly examines all three parts of the newplatform: Windows 7 Core OS, the Windows Live applications, andWindows Live Services. 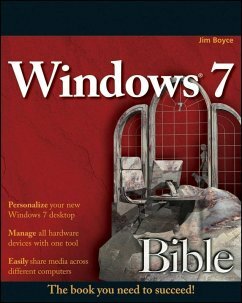 Windows 7 Bible shows you everythingyou need to know to make the most of Microsoft's new operatingsystem. * Covers Windows Live Essentials, including Windows Live FamilySafety, Mail, Messenger, Movie Maker, Photo Gallery, Toolbar,Writer, and Microsoft Office Outlook Connector * Shows how to use Windows Live Services, including Hotmail andSpaces * Explores new features including Desktop Gadgets Gallery,Desktop Windows manager, updated Fax and DVD Maker, an updated"Devices and Printers" option, and Sticky Notes * Explains new features in the Calculator, ribbon features inapplets such as Paint and WordPad, the new Media Center, andsearching updates * Fully covers the first complete overhaul of applets in adecade With Windows 7 Bible at your side, you can learn as muchor as little as you need to know for the way you use Windows. Jim Boyce has been a Microsoft MVP, and has authored or coauthored over 50 books and hundreds of articles and white papers on computer topics including Windows, Windows Server, Office applications, and programming. He regularly contributes to several online sites and publications. Part I: Getting Started, Getting Secure. Chapter 1: What's New in Windows 7. Chapter 3: Sharing and Securing with User Accounts. Chapter 4: Parental Controls and Family Safety. Chapter 5: Help, Support, and Troubleshooting. Chapter 6: Troubleshooting Startup Problems. Part II: Batten Down the Security Hatches. Chapter 7: Blocking Hackers with Windows Firewall. Chapter 8: Conquering Malicious Software. Chapter 9: Automatic Updates as Security. Part III: Personalizing Windows 7. Chapter 10: Personalizing Your Work Environment. Chapter 11: Ease of Access, Speech, and Language. Chapter 12: Transferring Files from Another Computer. Chapter 13: Customizing Startup Options. Chapter 14: Using Windows 7 Programs and Accessories. Chapter 15: Troubleshooting Customization Problems. Part IV: Using the Internet. Chapter 16: Using Internet Explorer. Chapter 17: Blogging with Writer. Chapter 18: Using Windows Live Mail. Chapter 19: Chatting and Texting with Windows Live Messenger. Chapter 20: Beyond E-Mail and the Web. Chapter 21: Managing Names and Addresses. Chapter 22: Troubleshooting Internet Problems. Part V: Pictures, Music, and Movies. Chapter 23: Working with Pictures. Chapter 24: Making Music with Media Player. Chapter 25: DVD, Video, and More. Chapter 26: Fun with Media Center. Part VI: Managing Files and Folders. Chapter 28: Understanding Drives, Folders, and Files. Chapter 29: Managing Files and Folders. Chapter 30: Searching for Files and Messages on Your Computer. Chapter 31: Metadata and Power Searches. Chapter 32: Using CDs and DVDs. Chapter 33: Protecting Your Files. Chapter 34: Troubleshooting Files and Folders. Part VII: Printing, Faxing, and Scanning. Chapter 35: Installing and Managing Printers. Chapter 36: Printing Documents and Screenshots. Chapter 37: Managing Print Jobs. Chapter 38: Faxing and Scanning. Chapter 39: Troubleshooting Printing and Faxing. Part VIII: Installing and Removing Programs. Chapter 40: Installing and Upgrading Programs. Chapter 41: Getting Older Programs to Run. Chapter 42: Repairing and Removing Programs. Chapter 43: Setting Default Programs. Chapter 44: Managing Programs and Processes. Chapter 45: Troubleshooting Software Problems. Part IX: Hardware and Performance Tuning. Chapter 46: Installing and Removing Hardware. Chapter 47: Using Wireless Bluetooth Devices. Chapter 49: Performance Tuning Your System. Chapter 50: Troubleshooting Hardware and Performance. Part X: Networking and Sharing. Chapter 51: Creating a Home Network. Chapter 52: Sharing Resources on a Network. Chapter 53: Using Shared Resources. Appendix A: Upgrading to Windows 7. Appendix B: Installing Windows 7 on a New System. Appendix C: Universal Shortcut Keys. '...readable, easy to understand and packed with useful references for all.' (IT Training, March 2010).